Renzi’s Jobs Act, a package of policies designed to instill greater flexibility in the Italian labour market, is based on shaky economic foundations and could even lead to further economic decline. Matteo Renzi election poster in Naples. Demotix/isoimages. All rights reserved. As the Italian economy enters a moment of temporary stability the prognosis remains bleak for the country’s youth. While figures are dropping elsewhere in the EU, in October unemployment among under 25s in Italy rose to the record level of 44.2% with many others living in a state of chronic underemployment. 79% of under 30s live in their parental home and the average age for achieving ‘economic independence’ is 35. Hundreds of thousands continue to leave for Germany and Britain and those who remain are paralyzed by the sense of belonging to a lost generation, without a future. It is clear that something must be done to address the structural issues underlying these phenomena, both to protect the dignity and health of those who are suffering this profound existential crisis and more broadly to ensure the long-term future of the country’s democracy. Last year President of the Republic Giorgio Napolitano cited youth unemployment as the most important challenge to be overcome by the new left-wing government, a “social crisis” which must be placed “at the centre of political action”. A year on the time has come to make good on this promise. The young and charismatic Matteo Renzi, who has so far managed to fend-off opposition to his government by Beppe Grillo’s Eurosceptic Five Star Movement, is in the midst of an initiative to translate concerned rhetoric into effective policy. So far Renzi has only committed to abstract measures, to enact the EU’s somewhat limp youth guarantee (to provide a ‘decent’ job offer for all youth within four months of leaving education or training) and encourage more apprenticeships. It is clear, however, that the lives of a new generation of Italians will not be determined by abstract EU policies targeted at this demographic, but through a more significant and concrete redesign of the Italian employment system. Renzi’s Jobs Act, a package of policies designed to instill greater flexibility in the Italian labour market, aims to remove the bureaucratic restraints that employers face when hiring and firing workers and applying for licenses. The measures include a redefinition of company sizes, new rules on fixed-term contracts and most controversially a revision to article 18 of the Italian workers' statute, which is in place to prevent companies downsizing during a crisis. Renzi’s reasoning behind the reform is one typical of economic discussion in the Mediterranean; that the Italian economy is rigid and is not fit to trade in a volatile globalized Europe. While he is no doubt correct that red tape is holding back job opportunities for the young, there are several reasons to be suspicious of his prescribed cure. First, the presentation of Italy as housing a ‘rigid’ economy is at odds with several studies which suggest precisely the opposite. Earlier this year OECD research demonstrated that Italy already possesses the most fliexible labour market in the EU. This is certainly evident from the perspective of working contracts. The country has 46 kinds of contractual arrangement, 41 of which can be classified as ‘precarious’. Quite simply, the crisis is not the result of workers’ rights or trade union bargaining power but of slow public administration and the debt accrued by Silvio Berlusconi. More fundamentally, however, the act itself is not as revolutionary as it is being presented. The Italian state has tried to instill ‘flexibility’ many times before through the Treu Law in 1997, the Biagi Law in 2003 and most recently the 2012 Fornero Law, which itself was designed to “facilitate entry into the labour market”. Given the steady decline in productivity it could hardly be said that these measures were successful, indeed each one was followed by an immediate spike in unemployment and a drop in productivity. While the Jobs Act is more comprehensive than these previous reforms it must for these reasons be understood as a more extreme manifestation of a strategy that has repeatedly failed. What is Renzi trying to do then? And if the potential for further catastrophe is so high why was a draft of the Jobs Act recently approved by the upper house? The unemployment emergency is the obvious answer, but beneath the surface a wider political agenda can be gleamed regarding Italy’s position in the EU. 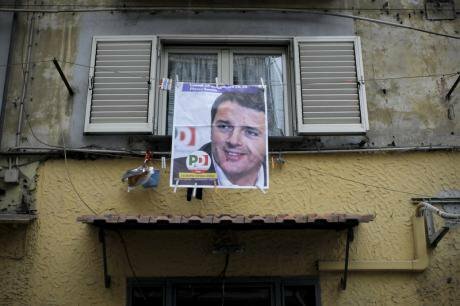 Renzi has pacified his left-wing allies with charismatic anti-austerity proclamations. His actual policy suggestions, however, are a clear continuation of the agenda proposed by Mario Monti, the unelected Brussels technocrat who ruled the country between 2011-13. The Jobs Act, for example, pays a close resemblance to the German system of ‘mini jobs’, the state-sponsored scheme in which workers are encouraged to take temporary work of 20 hours a week to earn a salary of roughly €400 per month. 7.3 million now live on this income alone. In Germany, which boasts a strong welfare system, transport and social housing, life is just about bearable on this sum, though it remains controversial and has been identified by many as a political tool for generating inequality. Italy, on the other hand, has no such public services. Rents in the major cities are overpriced and there are no unemployment benefits. Renzi is playing a big bluff: simulating the German model in order to attract international investors and hoping they can take responsibility for saving the country. It is a clever political game: by pushing young people out of unemployment and into even more precarious jobs, the PD can overcome the embarrassing statistics in order to gain further political support at a domestic level and greater bargaining power with the Troika. The strategy, though, will come with an immense human and democratic cost. It is estimated that 70% of Italy’s new hires are engaged in precarious work, linked to endemic poverty and mental problems. Any increase in this will bring personal social unrest. This weekend CGIL, the Italian federation of trade unions, held a large demonstration in Rome against the Jobs Act with an estimated turnout of one million. This was a symbolic act, a sign that the unions are adopting a more oppositional stance than their previously dutiful role as the street movement of the Partito Democratico. A general strike is scheduled for December and it looks to be the first of many. Amongst all of this, however, the real victims are the young precariat, a growing group of socially excluded poor without representation in parliament or the workplace. This group cannot survive more of this and is in desperate need a stimulus package, investment funds and security guarantees. International observers should not be fooled by Renzi’s debonair performance. The Jobs Act is not a panacea but just another vain attempt to simulate a recovery.